CarGurus has 33,932 nationwide CX-5 listings starting at $6,500. The 2015 Mazda CX-5 is a hoot to drive, as long as you subscribe to the philosophy that it’s more fun to drive a slow car fast than a fast car slow. Like most Mazdas, the CX-5 puts a smile on the driver’s face. But it needs improvements in terms of functionality to better compete with some of the more popular models in the compact crossover class. Mazdas are somewhat like Hollywood B-list actors. They’re recognized on the street, and they may even have a small and intense following, but for whatever reason they lack widespread appeal and aren’t necessarily the first choice when casting for a role in a movie, or as is the case for a Mazda, the role of your daily transportation. Most automotive enthusiasts are Mazda fans (you can count me as one), because almost all of the company's vehicles are terrific to drive and pretty to look at, and because they’re not ubiquitous like Hondas or Toyotas, they wear a mantle of uniqueness. 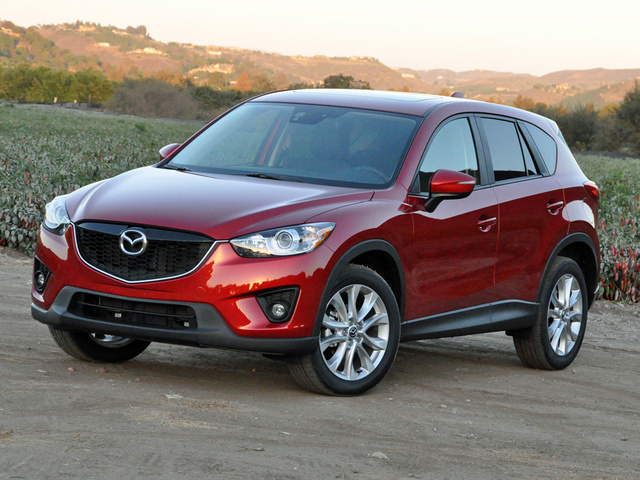 The 2015 Mazda CX-5, the automaker’s entrant into the popular compact crossover vehicle category, is indeed attractive to behold, with its sculptural sheetmetal and pugnacious stance. And it’s a hoot to drive, as long as you subscribe to the philosophy that it’s more fun to drive a slow car fast than a fast car slow. But when you’re competing against longtime stalwarts such as the Honda CR-V and Toyota RAV4, you’ve got to get the compact crossover SUV exactly right. In my opinion, the Mazda CX-5 falls short, but is the clear choice of this trio for those who value an engaging driving experience over ultimate functionality. 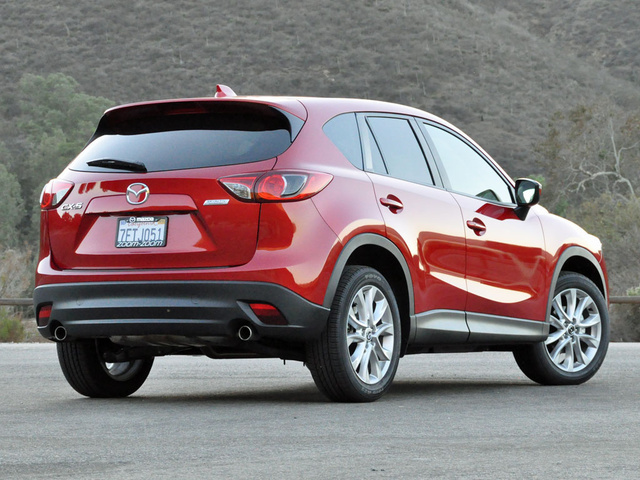 Mazda offers the CX-5 in three trim levels: Sport, Touring and Grand Touring. The CX-5 Sport starts at $22,375 (including a destination charge of $830), and is equipped with a standard 6-speed manual transmission. An automatic transmission runs another $1,400. At that price, the CX-5 Sport is equipped with just about everything you might need except for Bluetooth, which is part of a bargain-priced package containing a whole bunch of other stuff for $400. If you also want all-wheel drive, plan to spend another $1,450. The Mazda CX-5 Touring trim level ($25,795) adds upgrades in the form of a peppier engine and a standard automatic, along with the Sport’s optional Bluetooth Audio Package containing text-messaging support, E911 automatic emergency notification, Pandora Internet radio and a 5.8-inch color touchscreen display upgraded with a reversing camera in this model. Additional standard features include keyless entry and push-button ignition, an upgraded sound system, a 6-way power driver's seat, a blind-spot warning system, upgraded interior trim and dark tinted privacy glass. The CX-5 Grand Touring ($28,800) rides on 19-inch aluminum wheels and adds leather upholstery, heated front seats and side mirrors, rain-sensing wipers, dual-zone automatic climate control, a power sunroof, a premium audio system and more. 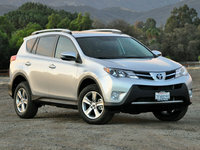 For additional cost, both the Touring and Grand Touring models are available with a Technology Package. This adds Mazda’s Smart City Brake Support System, adaptive bi-Xenon headlights, a navigation system and other upgrades. My test vehicle for the week, a CX-5 Grand Touring with front-wheel drive, had the Technology Package, premium Soul Red paint and some additional accessories that ballooned the sticker price to $30,910. Undeniably attracted to its lustrous paint and good looks, as well as the larger 19-inch wheels that give the Grand Touring a better overall stance, I accepted the CX-5’s key fob, opened the driver’s door and faced a gloomy, dark, black-on-black interior. Getting in was like being embraced by Lord Vader himself. I much prefer the CX-5’s lighter, airier Sand-colored interior, but Mazda offers it in conjunction with too few exterior hues. There’s no denying that the CX-5 is fun to drive. From its well-calibrated brakes and precise steering to its athletically tuned suspension, flinging this crossover along sinuous paths at misguided speeds is a worthy use of your time. Some credit also goes to the CX-5’s tidy dimensions and grip from the big 19-inch wheels that come standard on the Grand Touring model, but what shines brightest is the suspension’s ability to remain planted through tight corners while masterfully transitioning weight around a center of gravity that's taller than that of a traditional car. The CX-5 is a pleasure to drive around town, too, soaking up most bumps with ease and delivering a smooth yet lively ride. Power-wise, it’s a bit of a slog to get the engine revving high enough to deliver decent power, but the right pedal is responsive. No, the CX-5 is not a fast crossover—and my test vehicle had the larger of two available engines. Touring and Grand Touring versions of the CX-5 are equipped with a 184-hp, 2.5-liter 4-cylinder engine, and while that figure is competitive for the class, the CX-5 simply doesn’t feel as quick as it should, given Mazda's zoom-zoom advertising. A 6-speed automatic transmission delivers power to the front wheels, and all-wheel drive is optional for those who live where the weather is regularly inclement. Shifts come swiftly and smoothly, making best use of the engine’s output. 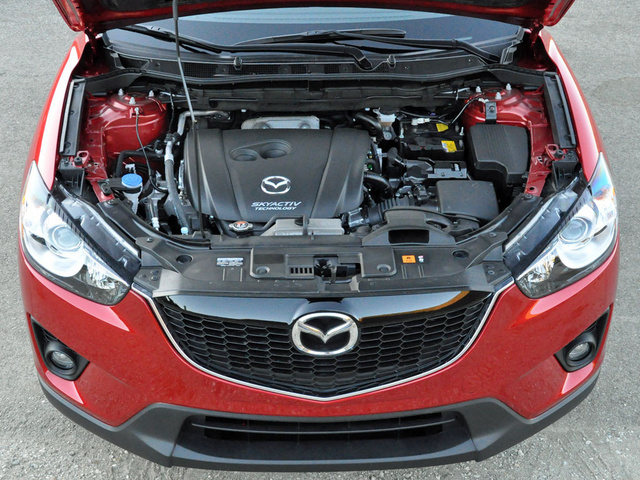 To meet tough EPA fuel-economy regulations, Mazda has switched to high-compression 4-cylinder engines dubbed “Skyactiv.” The EPA says my CX-5 Grand Touring with front-wheel drive should have returned 27 mpg in combined driving. I averaged 24 mpg while bopping around the suburbs of Los Angeles. That’s disappointing. As far as comfort levels are concerned, few people will find a reason to complain about the CX-5’s driver’s seat. It is supportive, and it’s easy to find a good piloting position. The front passenger may complain about the lack of a seat-height adjuster, though. Adult rear-seat riders will find snug accommodations, although not necessarily torturous. My young children were happy enough back there, but their feet sure made a mess of the CX-5’s black interior. Seemingly designed to provide a more intimate feeling, the CX-5’s black-on-black cabin is dark and even a little claustrophobic, which is why I recommend checking into that lighter Sand interior color. Minuscule controls, a tiny 5.8-inch infotainment screen and limited center-console space don’t help to improve this impression. Everything is constructed of nice-feeling materials with little to complain about in terms of fit and finish, however. I’m not a big fan of the CX-5’s center-stack controls. The knobs are well marked but too small, and it was frustrating to change radio stations using the elfin tuning knob. Plus, there’s little in the way of articulation, and it requires minute, precise rotations to switch away from Loverboy on the '80s station as quickly as possible. 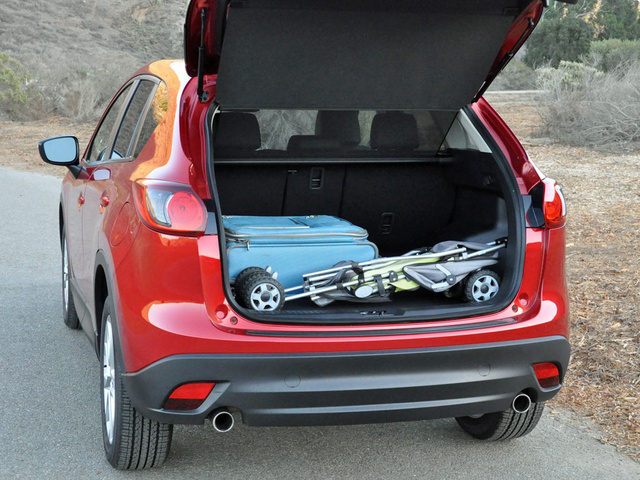 Open the CX-5’s rear hatch and you’ll find 34.1 cubic feet of cargo space behind the rear seat. That’s well short of a Toyota RAV4 but nearly as much as a Honda CR-V. Still, the space seems too narrow and small. On Halloween night, bags of costumes and the spoils of trick-or-treating seemingly ate up the entire space. Flip down the rear seats and you can fit a maximum of 64.8 cubic feet of your belongings. That’s an entire Miata trunk’s worth less than the Honda and significantly undersized when compared to the Toyota. For my family of four and our needs, the Mazda CX-5 proved to be a little too compact and left me wishing for greater flexibility. What’s particularly strange to me is that I didn’t feel that way about the Mazda 3 hatchback I drove immediately following the CX-5. Just about any CX-5 that you find parked in a dealership’s inventory is going to include, either as standard equipment or as an option, Mazda’s Bluetooth Audio Package. 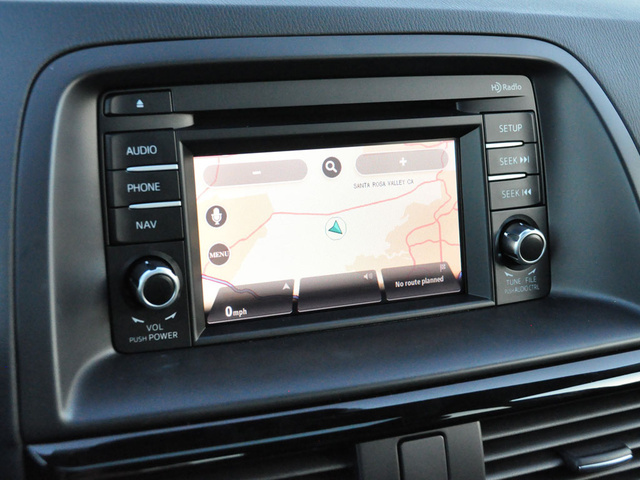 In addition to standard USB connectivity, this setup equips the crossover with Bluetooth calling and music streaming, HD Radio, satellite radio, text-messaging support, Pandora Internet radio and E911 emergency services connectivity, all operated using a 5.8-inch touchscreen display that also includes a reversing camera. While this sounds fairly modern and comprehensive, the system is not offered with more sophisticated functions, like a smartphone app, and the screen itself is too small and too far away, giving the CX-5 a bit of an old-school look and feel. A Tom Tom navigation system is optional, but is one of the worst that I’ve used. The teensy display shows little in the way of useful information, the graphics are quite dated, response proved agonizingly slow, and when zooming out to get traffic data, roadways and information disappeared outside of what appeared to be a 5-mile radius from my current location. The whole system is far from intuitive, causing much frustration and grousing. Making matters worse, the setup distracted from my driving when performing even the simplest of functions. What the CX-5 needs more than just about anything is the superior MazdaConnect infotainment setup that’s available in the Mazda 3. Mazda makes up technical ground on the safety side. The Touring model is equipped with E911 emergency services connectivity, which makes it easy to get help when you really need it. Additionally, this version of the CX-5 comes with a blind-spot monitoring system, while the CX-5 Grand Touring includes rain-sensing windshield wipers. Unfortunately, Mazda does not yet offer a rear cross-traffic alert system for the CX-5. However, both the Touring and Grand Touring can be upgraded with a Technology Package containing Smart City Brake Support, a collision avoidance/mitigation system that uses a laser to scan the road for danger. If it detects that a car or pedestrian is ahead, it will actively apply the brakes to slow or stop the CX-5, providing a nice insurance policy for those moments when you’re stuck in stop-and-go traffic and checking Facebook rather than driving. The Technology Package also includes bi-Xenon headlamps with an adaptive front lighting system that pivots the headlights in the direction that you’re steering. This, and the Smart City Brake Support, added to my peace of mind while slowly driving through Queen Elsa-infested neighborhoods on a spooky Halloween night. In the event that a collision is unavoidable, there’s a good chance you’ll survive the impact in a Mazda CX-5. This crossover receives a 5-star overall crash-test rating from the National Highway Traffic Safety Administration (NHTSA), while the Insurance Institute for Highway Safety (IIHS) has given the Mazda CX-5 a Top Safety Pick designation. Take impressive reliability predictions and what's expected to be low cost of ownership, and combine them with lease deals, bonus-cash offers and low-rate financing, and a Mazda CX-5 appears to make smart financial sense. The icing on the cake is an impressive fuel-economy estimate. The trouble is that I didn’t get particularly close to the EPA’s 27-mpg fuel-economy estimate. And while Consumer Reports sure is impressed with the CX-5, owners responding to J.D. Power surveys are not. An average depreciation rating from ALG and average warranty coverage also dampen the glow surrounding this crossover SUV, though 3 years of free roadside assistance is something you don’t get with a few of the CX-5’s key competitors. So, is this a good buy or not? I think so. Mazda dealers want your business, and they’ll make the deal competitive. The quality is there. The reliability is there. Just don’t expect to pass by as many gas stations as you might surmise from those EPA ratings. 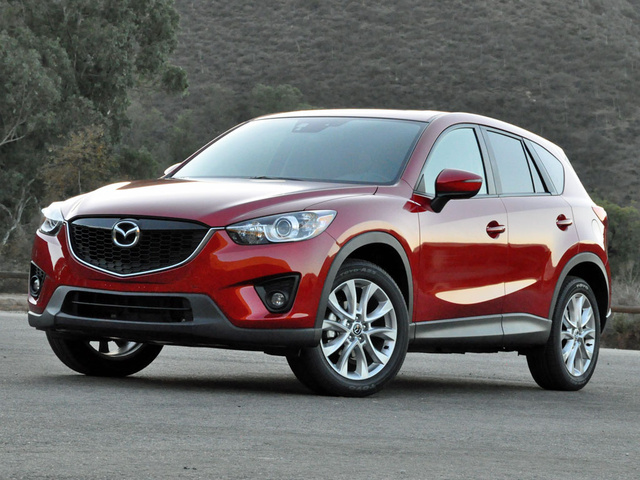 What's your take on the 2015 Mazda CX-5? Displaying 1 - 10 reviews out of 11.
fleetandre Mazda has definitely redefined SUV standards with its Mazda CX-5 - with a notably award-winning formula for a car that is fuel-efficient yet powerful. Oh and the inside cabin is absolutely amazing. Excellent write-up and review. ed02150 The CX-5 is an attractive offering marred by the worst audio/navigation system offered by any major automaker. Unfortunately, most shoppers won't realize just how bad the system is until after the purchase. If you're considering this vehicle, read the various Mazda owners' forums and see what CX-5 and Mazda 6 owners have to say about the "premium" Bose and Tom Tom navigation system. Stay away from both. If you choose to buy this vehicle, get the base audio system and upgrade it after. You'll be much happier than those of us who chose the upgraded factory option. Cooliedingus I bought my the 2015 CX5 GT AWD in September 2014, my first Mazda after many Hondas and Toyotas. This review is very accurate to my experience. Though I love the vehicle overall, I am very disappointed with the fuel economy. We are not aggressive drivers, drive mostly in the city with at least 2 hours of highway driving per week. The best we've seen in the average mpgs is 24, with 20-22 more common. Mazda boasted 24 city and 30 hwy, which was a principal factor in choosing this vehicle. We would be satisfied with 24 average, but lower is not acceptable. We brought it to the dealership service, the mechanic mentioned many others have complained about this and seen even lower numbers. Though fun to drive, I wouldn't buy another one and have lost a little trust in Mazda because of it. Matthew I'll agree that I am not getting what was predicted for MPG's. But compared to my old 2003 Ford 4X4 Ranger I am abundantly happy! I'd say I'm getting about 24 MPG overall. I am more than satisfied with the navigation/audio system in my Grand Touring AWD CX-5 (which has all the bells and whistles included). I also love the Darth Vader interior of black on black - but then I love dark blue or black in anything. I would hate anything light and sand colored as an interior in any vehicle as Liz Kim, the reviewer would prefer - I think its all about individual taste. The small screen is good for me - I didn't want a large screen hogging up my interior. I also love the different colors of the dash board lighting (some reviewers don't). White for the main dash readings, MPG and other indicators, then orange for the heat and AC controls, then white again for nav/sound system. It really separates all three regions well. Only thing which bothers me a little is the bright-lights indicator and the engine temp (cold) displays are the same color blue and sometimes I think I have my brights on when an oncoming car approaches - but its just the cold engine light on (which goes off when the engine is warmed up) - I put on my brights sometimes right into the eyes of an oncoming driver. I love my color of Reflex Blue Mica - the coolest color of all the SUV's out there. And look and build quality of this vehicle is amazing. I love driving it - but be warned - if you live in Maine you better ditch them 19" wheels and buy 4-16" wheels and 16" snow tires for the winter - the 19" are pretty horrible in the snow - they are for warm weather times - and I am looking forward to seeing how this baby does in the spring with those 19" wheels and tires - maybe my MPG's will dramatically improve. I love my CX-5 and am really happy I bought it. Dealers will cut you a pretty good deal too - if you use True-Car/Consumer Reports as bargaining chips. Good Luck! CMdriver Bought the 2015 Grand Touring FWD in May 2015. Sold my 2006 Toyota Solara 6cyl for it. I'm very disappointed with the overall mileage and the highway mileage. I took two long trips - all highway except for 2-5 miles - used cruise control - only got 25.5mpg! Are you kidding me? My Solara got 32.5mpg on the highways. This Mazda is horrible on mileage. Average mileage on a tankful has not been above 24. I've had Hondas and Toyotas for the past 30 yrs. Usually keep my cars for 9-10 yrs. That will not happen with this CX5. This is my first and last Mazda. I'll be sending a letter to Consumer Reports too. Maybe they can warn others. Elizabeth I just bought a 2014 that had 13,000 miles on it. I drove an 2013 Acura ILX And traded in. 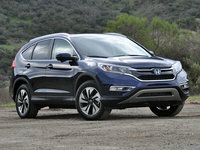 I looked at all reviews on the compact SUV's and drove the top rated Honda CRV, Looked at the GMC Terrain, tried the Oldsmobile Encore, and the Toyota Ravines 4. When I sat in the Mazda I immediately loved the roomy interior, numerous safety features, user friendliness of the Nav, Audio, etc. It drives quiet and is very comfortable. I couldn't be happier! Podv33 I think that this review, although focussed on the car, is compared ambiguously to other competitors in its class by the author. Fuel economy, power and cargo room etc. including CVT. Versus 6 speed auto are worthy factful comparisons. Michael I don't understand the your low gas mileage numbers. I bought my 2015 CX-5 new in Dec. 2014, and from day one have averaged 27 mpg overall. I drive a lot of short trips less than 5 miles, and have never seen the average drop below 26. I get 33 on the highway at 60 mph, and I have the larger motor and all wheel drive. The only thing that I can think of is that the people who say their mileage is in the low 20's must drive significantly more aggressive than I do, or maybe they spend a lot of time parked with the engine running. Most reviews I have read state mileage between 26-28 mpg combined. Displaying 11 - 11 reviews out of 11.
shaji I own the 2015 mazda cx 5 touring model and the biased review is awful. She might have 15 years experience but I know more about cross overs than her. I used to own a 2005 honda civic ex and driving the mazda is way better than my civic. I dont have to worry about the bad weather and the audio system is excellent. She writes a lot of negative stuff. 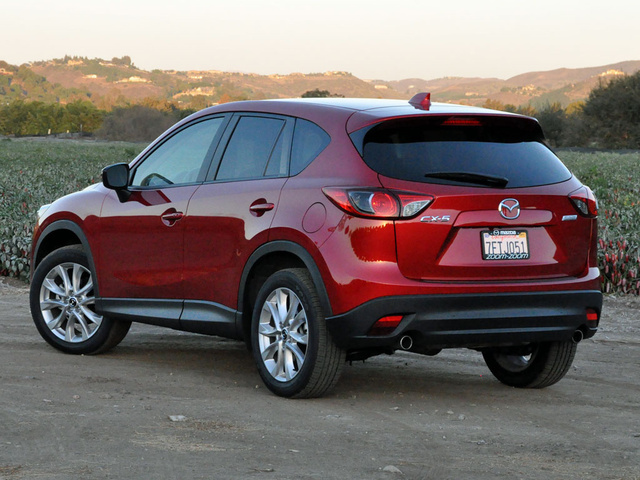 Users ranked 2015 Mazda CX-5 against other cars which they drove/owned. Each ranking was based on 9 categories. Here is the summary of top rankings. 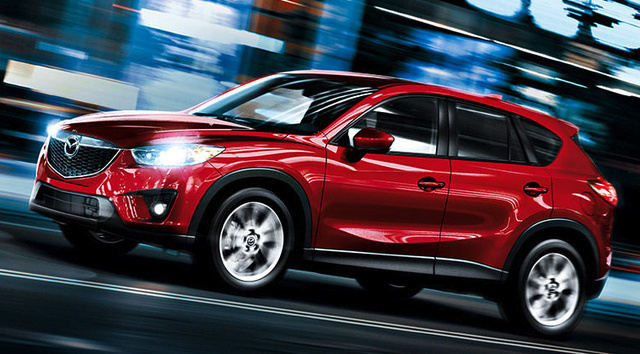 Have you driven a 2015 Mazda CX-5?